Noah Vonleh has a number of obvious qualities that make him such an attractive prospect including his height, length, build, excellent defensive rebounding, and burgeoning outside game. But his 11.5 possessions used per game is a relatively low number, showing how limited his role was within the Indiana offense and how much room he has to grow offensively. That being said, Vonleh was also one of the more efficient half-court power forwards in this draft. Among players likely to be drafted, only Cameron Bairstow, Adreian Payne, and Cory Jefferson used as many half-court possessions as he did and had a higher efficiency than his 0.97 points per possession. With 29.3% of his offense coming on post-ups, only Johnny O'Bryant drew a significantly higher percentage of his of offense from the post among power forwards in this class, and the 0.93 points per possession that Vonleh averaged was a fairly high mark considering his usage. Combine that with his absurd 1.32 points per possession he scored, which was by far the most among power forwards likely to be drafted, and there's quite a fair amount of intrigue based around Vonleh's inside-outside potential. Those numbers need to be taken with a little bit of a grain of salt, however. While Vonleh shows nice touch with hook shots over either shoulder, he could still stand to expand his post reportoire and build some diversity, not to mention improve his ability to recognize double teams and make correct decisions on pass outs. Vonleh turned the ball over on 14.9% of his post-up possessions, a fairly high amount for a player who generated very few assists from those situations. On the perimeter, for as great as his efficiency was, the overall sample size leaves something to be desired, as he attempted just 41 total jump shots on the year. While the form on his jump shot suggests that his jump shot should be a legitimate weapon going forward, whether or not he can maintain that incredible level of efficiency is something that may be difficult to pull off. Vonleh's 1.17 points per possession finishing around the rim is a fairly inefficient mark, especially considering his terrific standing reach and leaping ability were among the top marks posted among big men at the combine. In game situations, Vonleh seems to take a little bit of time collecting himself and isn't as explosive in traffic as one might assume, and his efficiency scoring around the hoop, off of cuts, and off of offensive rebounds was not as high as many may have expected just by looking at his measurables. Noah Vonleh measured out well in a number of situational statistics, but his overall low usage shows the growth he still needs to make to fully take advantage of his physical tools, as well as the confidence and assertiveness to really make his mark on a game offensively. Even with that substantial room for further improvement, the versatility he's shown on both ends of the court along with his tremendous physical tools gives him a pretty good shot to be a very productive professional, and at this point, likely the first among this group to hear his name called on draft day. 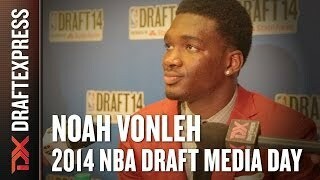 We joined Noah Vonleh as he works out in preparation for the 2014 NBA Draft, and discussed a number of topics with him, including what he's trying to improve on in the short-term and what he feels he can bring to a NBA team. A detailed video analysis by Mike Schmitz of how Noah Vonleh performed in his match ups against players and teams with NBA length and athleticism. Take a look at our brand new video section for a compilation of all the videos we've produced this year. Noah Vonleh: The Indiana power forward helped himself in a big way by measuring 6-8 without shoes (making him most likely between 6-9 and 6-9 ½ with shoes) and 247 pounds while sporting a massive 7-4 ¼ wingspan. Vonleh had the second-longest wingspan among all 60 prospects, second to only 7-footer Isaiah Austin (7-4 ½ wingspan). More importantly, Vonleh had the largest height-to-wingspan differential (8 ¼ inches). Vonleh also measured freakishly large hands in terms of length (9 ¾) and width (11 ¾), both tops in the combine. Vonleh's hand width measured second best in our database next to Greg Smith's 12-inch mitts. Aside from the hands Vonleh's physical measurements are fairly similar to 2010 draftee Derrick Favors, who measured 6-8 ¾ without shoes and 245 pounds with a 7-4 wingspan. Noah Vonleh is the second youngest prospect (after Aaron Gordon) in this draft class, but still ranks as the #1 rebounder among our top-100 prospects at nearly 15 rebounds per-40 minutes. With his 7-4 wingspan and terrific 242 pound frame, Vonleh has the body, length and intensity-level needed to compete on the interior in the NBA. He shows some ability to score both inside and out, flashing hook shots over either shoulder and range out to the 3-point line, but does not have the skill-level or aggressiveness needed to be a consistent scorer at the college level yet. Vonleh has made over half of his 3-pointers on the season, but takes less than one attempt per game, which indicates he still has plenty of work to do in this area. Additionally, he lacks elite explosiveness as a shot-blocker and finisher around the basket, and ranks as one of the poorest passers in this draft class, posting the worst assist to turnover ratio and assist per possession rate, to go along with the third worst PPR, which could be an issue as he transitions from the center spot collegiately to the power forward position in the NBA. Vonleh undoubtedly has the tools to play a significant role in the NBA for many years to come, but it will likely take a few years before we can accurately gauge whether he has the skill-level, assertiveness and offensive upside needed to develop into a featured option. Considering that he's one of the youngest players in this freshman class, and the fact that his Indiana team is struggling at just 4-6 in the Big Ten and could be on the outside looking in on Selection Sunday, it wouldn't be a surprise to see his coaching staff make a major push to try and keep him to stay in school for another season. Nevertheless, Vonleh's size, length and rebounding prowess, combined with the fact that he won't turn 19 until late August will almost certainly mean that teams drafting in the lottery will be happy to pick him and wait to see how he develops in an NBA uniform. Matchups against the likes of Syracuse, Michigan State, Michigan, Wisconsin, Connecticut and others have given us ample opportunity to evaluate Vonleh's strengths and weaknesses as a prospect, which we've done in the following video scouting report, courtesy of Mike Schmitz. One of the best long-term prospects seen at this tournament regardless of age, Noah Vonleh (#6 ESPN, #6 Scout, #2 Rivals) jumps off the page immediately with his outstanding physical attributes and hard-nosed mentality. Standing a legit 6-8, with a 7-3 wingspan, huge hands, a terrific frame and excellent athleticism, Vonleh does not look like your typical 16-year old. Vonleh's most impressive attribute is likely his motor. He runs the court extremely hard, crashes the glass with reckless abandon, and is as committed to his work on the defensive end as we've ever seen from a player this age. He has no problem banging in the post with players much older than him, showing nice timing as a shot-blocker, but he can also step out onto the perimeter and cover smaller players as well. Vonleh regularly goes out of his area for rebounds, particularly on the offensive end, and has a knack for touching pretty much every ball even remotely in his area thanks to his combination of length, explosiveness and sheer aggressiveness. Offensively, Vonleh is more of a work in progress at this stage, but is already well ahead of where you'd expect him to be considering his high school sophomore status. He is mostly a straight-line dribbler, but is more than capable of beating his man off the dribble from the perimeter and getting to the basket. Not one to force the issue, he has no problem passing the ball ahead in transition or finding an open teammate on a drive and dish play, as he's clearly an unselfish and team-oriented player. Vonleh has the ability to make shots from the perimeter as well, even if his release is a bit low and his mechanics are somewhat rigid, particularly when pulling up off the dribble. To fully make the transition to the small forward position, Vonleh will need to continue to tighten his ball-handling skills and improve the consistency of his jump shot, something he has plenty of time to do. It's not yet clear exactly what position Vonleh is best suited for long term. At 6-8, there might be an inclination for some to make him a full time perimeter player, but considering how gifted a rebounder he is and the fact that he has the length to defend either forward spot, he could have more value at the professional level as a face-up power forward. Considering he's only 16 years old, it's possible that Vonleh might not be done growing. Either way, Vonleh is clearly a very exciting young prospect with a bright future ahead of him. As long as he continues to work on his skill-level and does not get distracted by the tremendous amount of attention he's likely to generate, he has all the makings of a top shelf prospect.